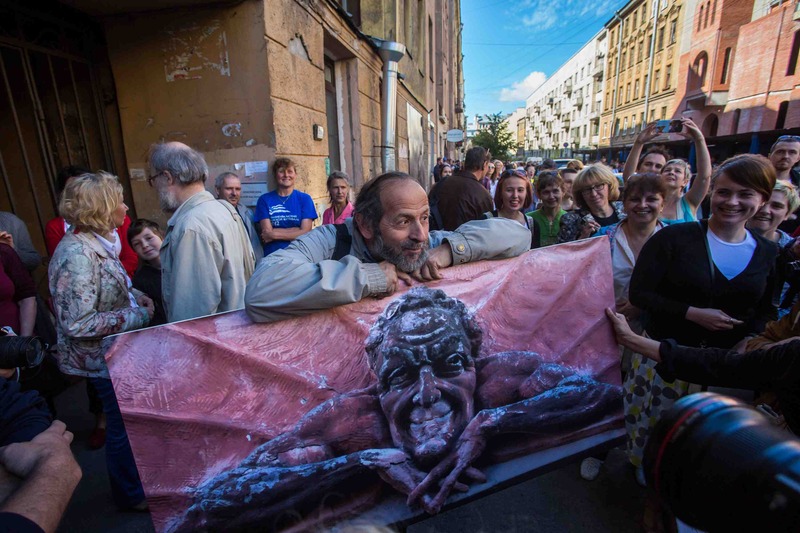 Novaya Gazeta reports that a popular assembly to protest the destruction of a bas-relief featuring an image of Mephistopheles took place today, August 30, on Lakhtinskaya Street. “This is not a rally; we are not using amplifiers and posters. 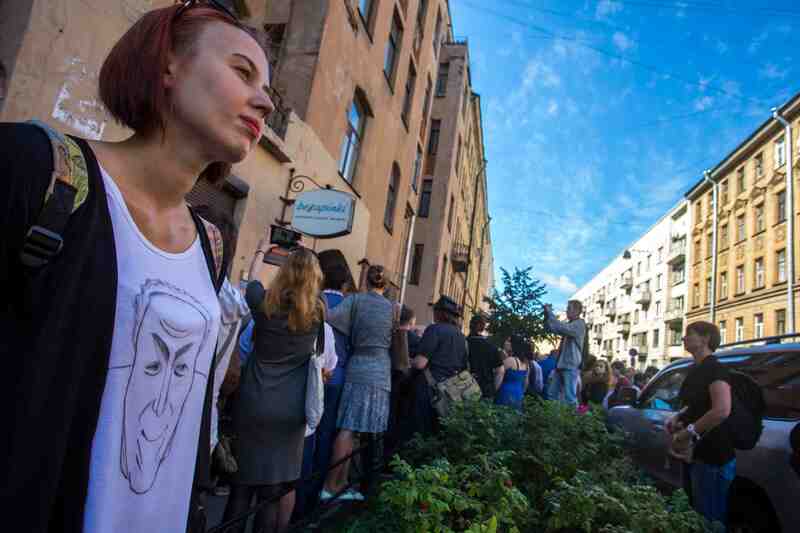 People have just come out to show how they feel about vandalism,” said Alexander Kobrinsky, a deputy in the St. Petersburg Legislative Assembly. About five hundred people attended the rally. They attached a temporary banner with a photo of the bas-relief to the facade of the building from which it had been knocked down. They also played a recording of Feodor Chaliapin’s rendition of the aria “Sérénade de Méphistophélès,” from Gounoud’s opera Faust, on their cell phones. 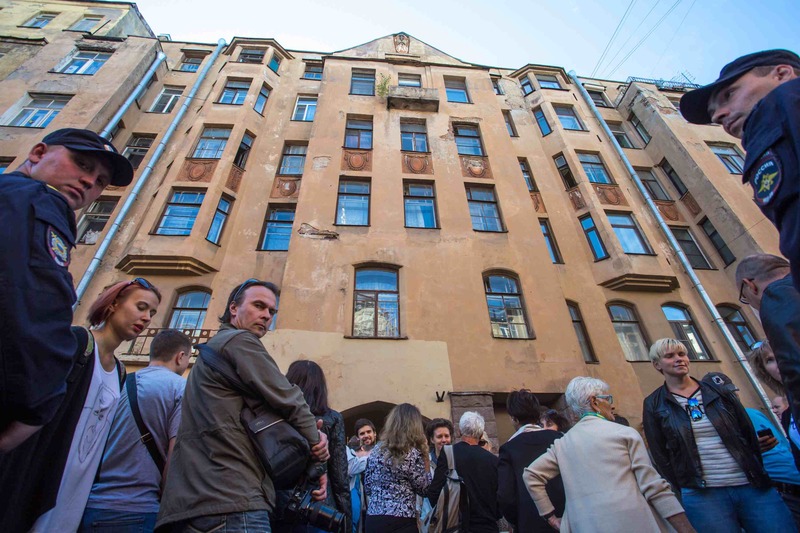 A 100-year-old bas-relief depicting the mythical demon Mephistopheles has been removed from the facade of a historical building in St. Petersburg overlooking the nearby construction site of a new Orthodox church, local inhabitants said. Mephistopheles is a mythical demon that appears as the devil in Johann Wolfgang von Goethe’s play Faust. The bas-relief of the character had been a feature of one of St. Petersburg’s minor landmarks, a building on Lakhtinksaya Street known as the House with Mephistopheles. Local news outlets and social media users reported that the relief was removed from the building without explanation on Wednesday. According to one Facebook user, historian Dmitry Bratkin, the house was designed by 19th and early 20th century architect Alexander Lishnevsky. 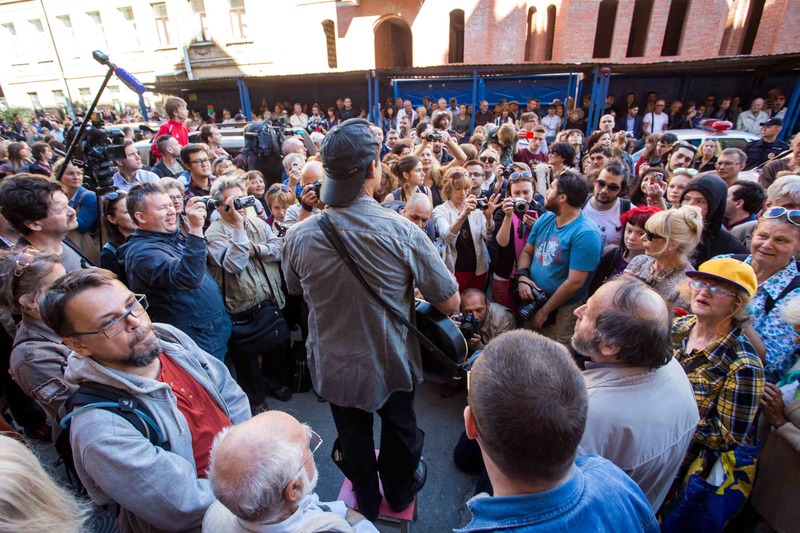 Instead, the workers asked the building’s residents to move their cars away from the building to avoid being damaged by falling plaster, and then proceeded with the removal of Mephistopheles, Alexeyev said. The promise of recreating a version of the bas-relief in plaster indicated that the demolition had been a “planned action,” supposedly approved by the authorities, instead of a grassroot stunt by activists displeased by the sight of a mythical demon, Alexeyev suggested. 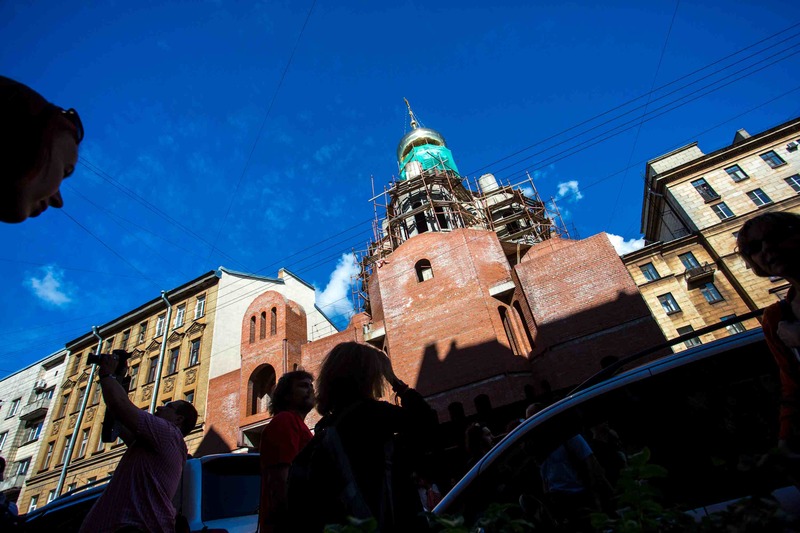 However, a spokesperson for the city’s architectural monument preservation department, known by its Russian acronym KGIOP, denied any knowledge of the incident, Novaya Gazeta reported. The removal of the historical bas-relief has also prompted protests by some local lawmakers. St. Petersburg municipal legislator Boris Vishnevsky has sent a complaint to KGIOP, while his fellow lawmaker Alexander Kobrinsky said he would ask police to open a criminal investigation on charges of destruction of cultural heritage sites, St. Perersburg’s Fontanka news agency reported. Some commentators also claimed that the removal of sculpture might be connected to the construction of an Orthodox church that would face the House with Mephistopheles. Natalya Levina, another local woman, said her neighbors had spotted “people from the church” looking around and inquiring about the “demon,” the Metro news agency reported. Historical preservation activists have asked police and the construction firm that is building the church about who had authorized removing the Mephistopheles image, Levina was quoted as saying. Both organizations denied having any knowledge of who authorized its removal, she said, according to the report. Lishnevsky, the architect, died during World War II after being evacuated to a hospital in Yaroslavl — a historical city 250 kilometers to the northeast of Moscow. Much of his work survived the devastation of the war and the secular policies of the Soviet Union. The Mephistopheles bas-relief was created in 1910-1911, Fontanka reported.